You’re going to learn 4 little changes you can make to your English right now to sound more natural. Also check out 2 Things You’re (Probably) Doing That Make You Sound Unnatural in English. 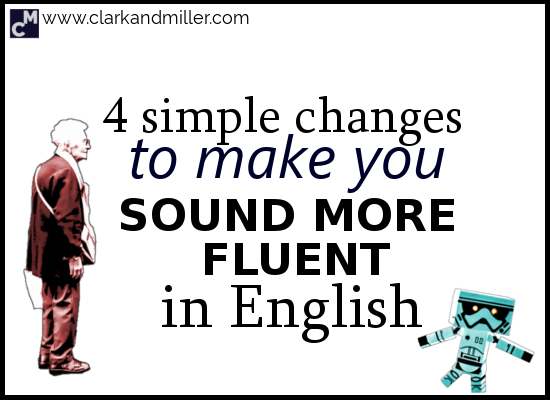 You can actually make a few small changes to your English and suddenly sound much more fluent. That’s because sounding fluent in English is a bit like a secret password. If you use these techniques, it’s like you’re giving a signal to the listener that you’re one of them — that you’re an expert English speaker, too. Today, let’s look at three of the most common ones. I want to talk about this one first because it’s very simple but probably makes the most difference between sounding like a robot and sounding human. OK, let’s look at a robot and a human having a nice conversation about vegetables. OK. So what’s the big difference between what the robot is saying and what the person is saying? That’s right! The robot is pronouncing each individual word. What he needs to do is use contractions. What are contractions? They’re two words shortened to one word. They’re a very important feature of natural-sounding English. When you don’t use contractions, it sounds really, really unnatural, but for some reason, even the highest-level learners do this. So how to fix it? Let’s look at a few examples. It saves time, it makes you sound more fluent AND it’s easier! What’s not to like? “But what about formal English and business English?” I hear you ask. And that’s when I tell you, “Yep, even in formal and business settings, we often use contractions.” Really — try to use them whenever you can when speaking. Probably. That’s probably what you say next. Anyway, there are generally three situations when we don’t use contractions. – Big Mike isn’t enjoying your spider game. – He is enjoying my game. He loves spiders. – Big Mike, are you really enjoying the spider game? We also tend not to use contractions in formal writing. Remember that language isn’t just about giving information. When you speak to someone, you’re also using language to create social connections — to show that you understand them and that you like them (or to show that you don’t understand them and that you don’t like them. That happens). So showing agreement is an important part of conversation. Now, I’m going to give you two simple phrases that you can use to show agreement and make stronger social connections. You might think you know these phrases, but I want you to make sure that you’re using them correctly. Because so many people get these wrong. Here’s another conversation between the human and the robot. That “so” makes a huge difference to how fluent you sound. But he’s about to make a mistake that so many English learners make. If you want to use a whole sentence, don’t use “so”! OK. So here’s the guide. Do you remember that I was talking about “secret passwords” in English? If you use certain phrases, the listener will understand that you “get it” — that you’re part of the expert English speaker club. There isn’t really an actual club, with a membership and a free glass of sherry when you arrive. And a butler who’s also an elephant. Nope, sadly that club doesn’t exist. So what are these phrases? These phrases actually don’t really have any meaning at all. They’re fillers. Let’s look at our robot one more time. This time he’s having a few problems describing things. Did you notice that the robot’s wearing a tie here? That’s because what he’s saying is actually perfectly fine in formal or business situations. But this robot’s at a party, and he needs to relax a bit. It’s kind of like soup but meatier, if that makes sense. It’s sort of like flying. But with more gravity. It’s hard to explain. He kind of said it and sang it at the same time. The plane didn’t really fly. It sort of floated in the wind. These phrases are really useful for situations that are kind of abstract and tricky to explain. When you use them, you’re inviting the listener to use their imagination a little. OK. So we just saw how our robot had problems with something difficult to describe. But, when you’re speaking, sometimes you just need a little time to think — to process what you’re talking about. Right. He just stopped in the middle of the sentences. So it’s good to make some sort of sound to signal that you’re just thinking and that you’re going to finish that sentence. You can use “umm…” and “err….” if you like. They’re usually fine. But I would also recommend using “you know…” in informal situations. It lets the listener know that you’re still thinking about what to say (and not staring at their beard). It also makes the listener feel a part of what you’re saying — even when you’re still thinking about it. OK. So now you have the power to push your English to a much more fluent place. What else do you think makes people sound more fluent in English? Tell me in the comments, and we can have a kind of conversation about how … you know … how we improve our English. Did you find this useful? Do you know any people (or pandas) that might also benefit from this? Then BE AWESOME AND SHARE! Spread the knowledge! Thanks for asking, Gabriel, and thank you for the picture of The Great Automatic Grammatizator. And I also like ‘then’ in the end of a sentence as the exclamation to express emotions. Yeah — these are good. A lot of great stuff. In fact, some of these might make a great post topic! I could do that, then! BTW, “But he’s about to make a mistake…” — The Immediate Future is the eleventh alternative to ‘will’, innit? We really like talking about the future in English. And we’ll continue to do so. We can often hear “I mean” instead of “you know” between sentences, and also “though” at the end. Ooohh… Of course. I’d forgotten about “I mean.” I like it. But “though” at the end. Wouldn’t you say that’s a slightly different feature? Well, I don’t know for “thought” because English is not my mother tongue, but I hear it so often in spoken English that this expression seems KINDA gutted to worthlessness so to speak… It seems people use it like “then”, as Andrey Tamboff says above. But I may be wrong. I think you’re right: “though” is really similar to the “then” that Andrey observed. It’s true — sometimes stuff gets really overused. I often did that when I was learning Turkish — as soon as I learned a new phrase like this (something to make you sound natural), I would do it to death. And thanks for your positive feedback. Now, go feed that Panda! Where is he, I mean this Panda, from, then? I never asked, but would “China” be a reasonable guess? I prefer pink frames and big letters? Great! I’m really happy they worked for you! Thanks Rajdeep. I hope they were super-useful for you! Great stuff as usual. Sağol!